The Boeing Model 200 Monomail was an American mail plane of the early 1930s. The aircraft marked a departure from the traditional biplane configuration for a transport aircraft, instead featuring a single, low set, all metal cantilever wing. Retractable landing gear and a streamlined fuselage added to the aerodynamic efficiency of the aircraft. A single example was constructed for evaluation by both Boeing and the US Army (under the designation Y1C-18) but no mass production ensued, and the aircraft eventually joined Boeing's fleet on the San Francisco-Chicago air mail route from July 1931. A second version was developed as the Model 221, with a fuselage stretched by 8 inches (20 cm) that sacrificed some of its cargo capacity to carry six passengers in an enclosed cabin, however the single pilot was in an open cockpit. This version first flew on 18 August 1930. 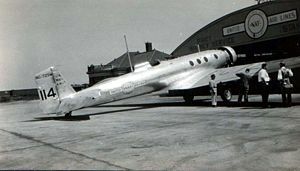 Both the Model 200 and the Model 221 were eventually modified for transcontinental service as the Model 221A, with slight fuselage stretches to give both a cabin for eight passengers. These aircraft were flown on United Air Lines' Cheyenne-Chicago route. The advanced design of the Monomail was hampered by the lack of suitable engine and propeller technology. By the time variable pitch propellers and more powerful engines were available, the design had been surpassed by multi engined aircraft, including Boeing's own 247.